Try to get a third floor room or above with sea view. This is a relaxation resort. There are very few places to eat and drink and almost no shopping experiences to be had. Only two supermarkets owned by the same family I understand. If you stay here it is advisable to have some transport for at least part of your holiday. The island is small and largely un spoilt. Not a resort for you if you like bars and fast food outlets. The best thing about Santo Thomas is the beach. Lovely fine sand and clean clear sea that sloped gently, ideal for children, although a flag system operates and should be observed. The resort is small and on the flat. The two supermarkets in the resort are identical and the prices are the same (extremely expensive). If you are self catering it is well worth catching the bus (if you do not have a hire car) to Migjorn (only 1.15 euros) and 10 minutes away where the prices in the supermarkets are half of those in the resort. The few restaurants in the resort were all expensive and served moreorless the same menu. The prices they were charging made it very pricey, especially if you are a family with children. So if you choose to go to this resort take plenty of euros, you will need it. I would not return to Santo Thomas for this reason. The resort is quiet and on a no through road. The beach is lovely, big enough for everybody. we hired a car and saw most of the island and I think this was the best beach we went to. There is very little to do at night, we took our daughter to the mini disco every night at 8pm at Las Dunas across the road which was free, but then we spent another 3 euros each night on the ball pit! The one big problem with this resort is the price of the food to eat out and at the supermarkets. You have probably read before that the 2 supermarkets are owned by the same person and very expensive, this is soooooo true! Example, washing up liquid 2.50 euro!! and the supermarket was very limited and sold very few fresh fruit and veg. The restaurants were no better, very expensive and very limited menu. we ate at Las Dunas and had 4 lots of chicken and chips. I sent mine back as I ordered veg with mine, but it was awlful- out of a tin and all soggy. We had 3 beers and a coke, and came to almost 50 euro- a total rip off! As we hired a car we went to the big supermerket in Mahon and spent 90 euro and this lasted 4 adults and 1 child almost all week. So I would say only go to this resort if you are going to hire a car, or get on the bus to Es Mignon to get to the supermarket there. But the bus times were a bit rubbish and it would mean wasting a whole morning or afternoon. The resort was very pretty and clean. Lots of recycling bins and emptied every day, so no unsightly overflowing bins of rubbish - mind you we did witness a rat, in broad daylight on the day we arrived! 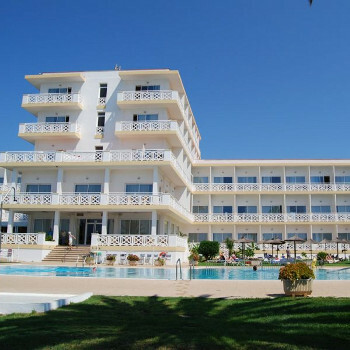 Resort entertainment is centred around the couple of big hotels in the resort and the Las Dunas Bar. The resort could do so much better with more facilities. Lack of restaurant choice, lack of bars. I know it is a family orientated resort but still there was a lack of choice. Beach was beautiful. The sand was clean. The sea was crystal clear and very shallow and extremely warm. Pedaloes for hire. Truly lovely! 2 small supermarkets, one at either end of the resort, not cheap. A few scattered shops. I would like to say I would visit the resort again, but maybe leave it a few years to see if more bars,restaurants and shops are created. It does have so much potential. If you have fantastic complexes like this one, its just missing something a bit more in the resort. The resot wa slovely and very clean and really afmily orientated wouldnt go for an adults only holiday definately a family environment! The only thing was it was very expensive to hire a sunbed on the beach for the day so take towels!!!!!!!!!! Sant Tomas is a quiet small resort with three hotels, some apartments and villas, five or so bars/restaurants, a couple of small supermarkets, a chemist and a few gift shops. Evening entertainment is hotel based. The beaches are excellent. The public transport is somewhat limited so a car is best for going out of the resort.